The CDC Foundation has revealed an updated logo, website, and tagline that is more inclusive of its work with private-sector partners. The CDC Foundation has rolled out a refreshed brand for the first time in its two-decade history. The Foundation revamped its logo, tagline, and website with a modern look that is more inclusive of its donors and partners, it said. The nonprofit worked with Seed Factory, a marketing firm based in Atlanta, and debuted the new look in a social video. "The previous tagline, ‘Helping CDC do more, faster,’ is important and we still do that, but our donors did not see themselves and our partners did not see themselves in that tagline," said Pierce Nelson, VP of communications at the CDC Foundation. "This tagline and logo provide an opportunity for donors and partners to see themselves in what we do." 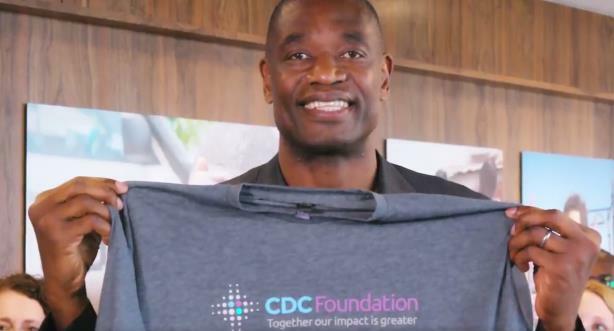 The CDC Foundation is also featuring board member and NBA legend Dikembe Mutombo in the social video to draw interest, said Nelson. "Dikembe does his own work in public health and in the health space," Nelson explained. "We worked with him on a video to extend that coverage and interest in our brand, particularly with our donors and potential donors to make them aware of this. We were trying to have some fun, but at the same time get the message across." The new tagline, "Together our impact is greater," is coupled with an updated logo that represents each of the CDC Foundation’s stakeholders: the CDC, donors, and partner organizations. The CDC Foundation operates independently from the CDC and supports its mission in partnerships with the private sector. Nelson also said the revamped website is part of a new focus on storytelling. The homepage was updated to prominently feature articles about the work CDC Foundation and its partners do around the world. "At any given point in time, we have between 200 and 300 programs going on," Nelson said. "We’ve done programs that have ranged from addressing the tobacco epidemic around the world to preventing infections in cancer patients. We wanted to give those stories a bit more prominence and play on our website and in our ongoing work with donors and communities."